Phew. Summertime can really take it out of you. I mean sun, beach, vacation, kids, food and wine…need I go on? It has been a full and busy summer for me and the peeps and I didn't mean to not update, but I decided to embrace all that comes with summer vacation, including not updating the site and boy did it feel good! Now it's time to settle back in, get back to work and find out everything that is worth knowing in my world. Actually I don't have much to catch anyone up on (unless you count sitting around and enjoying the sun something everyone needs to know), but here are a few of the highlights. I made this peach pie. It was soooo good, I recommend everyone having some end of summer peach pie. I have no pictures because it was so good no one remembered to take pictures. We were way too busy filling our pie holes with pie. I photo bombed fallen trees in the Redwoods. I would have loved to spent more time hiking there, but the kids are not of that age quite yet and there are plenty of years ahead for that! One set of parents moved to Oregon and we spent an afternoon checking out the Durant Vineyards/Red Ridge Farms olive mill and winery. I joined the club, bought plenty of oil and wine and can't wait to get my first club shipment. If you find yourself ever in the area, check it out. Well worth a taste and a walk through. I froze avocado's in hopes of being able to enjoy it through the winter (they were so cheap this summer), but my first taste test of the frozen items is not exactly what I hoped. I guess I will just buy them at the higher price for my sandwiches. 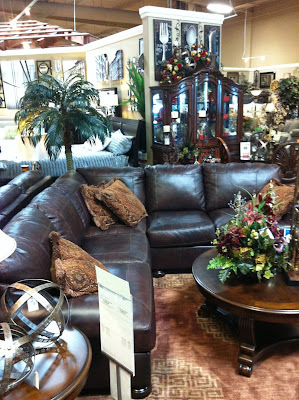 I bought a new couch (minus the tacky pillows and fake flowers), but I won't get it until October. Totally worth the wait! Annnnd that's about it for me. How about you? Anything new, exciting, thrilling or a must see and do?